LEFT: EIGHT OF SWORDS REVERSED. When this card appears in the reversed position, a difficult situation is finally unravelling. If you were once feeling trapped in this tight spot, you should be able to start finding your way out of it this week – or at least start to see the light. This is an number Eight card, and Number Eight energies tend to start slow; but when they build momentum, they become exponentially powerful. Hang in there. Your solution is coming. MIDDLE: FOUR OF CUPS REVERSED. When this card appears reversed, good for those of you stuck in stalemates. The Universe is lighting a fire under some backsides, and you should see some forward movement pretty soon – the message of this card is quite similar in some ways to the reversed Eight of Swords, but with the added benefit of creative new ideas coming along to inspire your path, moving forward. 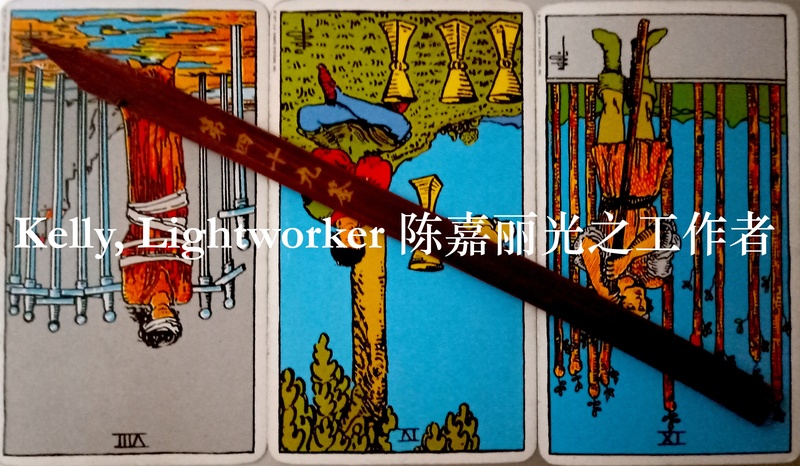 RIGHT: NINE OF WANDS REVERSED. Known as the card of the Wounded Soldier, this is a card that speaks of getting ready for a final onslaught. When it’s upright, a line is finally being drawn in the sand, and parties are getting ready for battle. When this card appears upside-down, you may find your strength waning – it’s a sign that the time is not right for a forward charge. Wounded soldier, take care of yourself: exercise patience, gentleness, and self-restraint. Restore yourself, and live to fight another day. Sky and earth freeze; water turns to ice. Why pursue your desires so greedily? Once clarity appears, your moment arrives. The timing of this lot is interesting. It describes a seasonal shift, which is exactly what we’ve just experienced: the Spring Equinox. And with this shift comes an energetic transformation that gives us tremendous opportunities to move forward and grow. Timing is the big issue we’re dealing with this week. When this lot is drawn, any attempt at pushing your boundaries or achieving something beyond your ability will fail. But it doesn’t mean that anything is wrong, so don’t jump the gun and doubt yourself or your plans. Water freezes into ice; ice then thaws back into water. What happens in nature is also reflective of Spiritual laws. The Bible states in one of its wisdom texts that To everything, there is a season, and a time for every purpose under heaven (Ecclesiastes 3:1). So bide your time, for your moment will surely arrive.